A traveler's resource addressing and answering travel-related questions. No question is too mundane or difficult. Have a question? Please send an email to travelerspen@yahoo.com. In an amazing feat, Miles Hilton-Barber flew halfway around the world. Blind. The British pilot departed London on March and arrived in Sydney on Monday. The journey was a total of 13,500 miles. "It's the fulfillment of an amazing dream," the 58-year-old adventurer said after touching down at Sydney's Bankstown airport. "I've been wanting to do this flight for about four years." Hilton-Barber flies with a sighted co-pilot but relies on speech output from his navigation instruments to steer his course, directing the plane from a wireless keyboard. "I've wanted to be a pilot since I was a kid. Now I'm totally blind and I've had the privilege of flying more than halfway around the world. The big deal is not me doing this, it's raising funds," he said. Hilton-Barber, who has been blind for 25 years, hopes the trip will raise some two million US dollars for the charity Seeing is Believing, which works to cut the incidence of preventable blindness in developing countries. Kenya: Africa's Newest Aviation Hub? With the rehabilitation of 15 airstrips, the renovation of the Moi International Airport, and the expansion of the Kisumu Airport, Kenyan government is making bold strides to become the leading aviation hub in Africa. Transport minister, Mr Chirau Ali Mwakwere, said that the move was in tandem with the ongoing harmonisation of aviation sector in the East Africa Community and Comesa region. He said the Government would continue to provide the necessary infrastructure and put in place appropriate policies to enable the aviation industry to thrive. "Kenya will be one of the leading countries in Africa in terms of aviation," he said. He added: "This year, 10 more airstrips are planned for upgrading while 14 more will be inspected for rehabilitation." Among airports earmarked for upgrading is Moi International Airport in Mombasa, which is currently under going renovation, and Kisumu Airport whose run way will be extended at estimated cost of Sh2.6 billion. At the Kisumu Airport, the terminal building will be expanded and the runway increased to 3.2km, from the current 2.1km, to accommodate bigger aircraft. A new control tower will also be built. Other facilities to be upgraded are lighting and security systems. Another airport in the sights of KAA for expansion is the Malindi Airport, which locals want to be upgraded to an international airport. The Wajir Airport terminal building has been constructed and the control tower rehabilitated for the airport to serve both military and civilian aircraft. Quote Source and entire article here. With one stroke of the pen, travel to Europe just got cheaper. In a landmark deal years in the making, the United States and the European Union signed an agreement to open up transatlantic markets, allowing airlines in the European Union to fly to any U.S city and vice versa. Which means, in March 2008, competition between airlines could equal lower fares for customers. The "open skies" deal that removed World War II-era barriers to service appears initially weighted toward European carriers, some of whom have begun to recognize what they anticipate will be new business opportunities. "Already, the European airline industry is feeling its effects in a positive way, with plans for new services and signs of a much more flexible and dynamic approach to airline investment among European carriers," Barrot said. As a result, several overseas airlines have been active in pursuing new routes. European low-cost airline Ryanair is exploring the possibility of transatlantic service between Dublin, Frankfurt and Barcelona to New York, Dallas and San Francisco. Virgin Atlantic plans to expand vigorously, possibly adding flights to the United States from Paris, Zurich and other cities within a couple of years. Ireland's Aer Lingus is also planning new routes. For the quote source and the entire article, click here. I just wanted to let everyone know my new blog, Outdoor Weblog, is now live at Creative Weblogging. Come on over and say hi! Question: I know this may seem like a simple question, but what is the best month for traveling? Answer: This is actually a good question and a very important one. Depending on the month you travel, your budget could decrease or increase dramatically. If you're on a budget, ideally, you want to travel during shoulder season, which during the spring is the months of March, April, and May and September, October, and November for fall. The weather may not be as enjoyable, but with the extra money you save invest in a good umbrella or an insulated jacket. In my opinion, the worse months for travel is during the summer. Gas prices are high. The weather is hot and humid. And hotels, highways, and airplanes are at capacity. If possible, avoid this time, especially if you're counting your pennies. * Have a question? Please send an email to travelerspen@yahoo.com or leave a comment. I know this blog has been silent lately, but I'm proud to announce that I'll be taking over Creative Weblogging's Outdoor Weblog! I know you're probably wondering about the outdoor-related posts, but they're samples for my new position. I don't have all the details about the job yet, but when I do I'll keep you posted! In the meantime, I plan on getting Traveler's Pen back on track soon. I'm returning to the original format of answering and addressing travel-related questions. So, if you have one, please send an email to travelerspen@yahoo.com or leave a comment. I'm also lining up travelers for the Traveler Next Door, if anyone's interested. With peak hiking season upon us, the folks at Leave No Trace are reminding everyone to..well..leave no trace when hiking or camping in the outdoors. To curve environmental damage created by hikers and campers, seven principles were drafted as a form of outdoor ethics. For a detailed overview of the principles, check out the Leave No Trace website. Summer is here. And with summer comes water sports: swimming, kayaking, diving, and boating. But, each year hundreds of people drown from submersion accidents. 1. Learn to swim. This is most important for children and teenagers, who are frequently in the water and often place themselves in precarious situations. It is also important for adults, particularly those who may need to self-rescue, such as surf swimmers, scuba divers, and river rafters. However, do not let swimming lessons create a false sense of security, particularly with children. 2. Do not tolerate horseplay in or around the water. This includes diving from heights into shallow water or water of unknown depth. 3. Avoid solo swimming; use the buddy system, so that someone is always on the alert to help a companion in need. 4. It is never safe to cross thin ice; one should be particularly careful during the spring thaw. 5. Alcohol and recreational drugs have no place anywhere near the water. It takes only a brief lapse of common sense to ruin a person’s life forever. 6. Never place non-swimmers in high-risk situations: small sailboats, whitewater rafts, inflatable kayaks, and the like. 7. When boating or rafting, always wear a properly rated life vest (jacket) with a snug fit and a head flotation collar. 8. Know your limits. Feats of endurance and demonstrations of bravado in dangerous rapids or surf are foolhardy. 9. Learn how to properly cross flowing streams of natural water. Do not attempt to cross a flowing stream where the water is above your knees. Read the full article at Medicine at the Outdoors. There are thousands of magazines dedicated to every conceivable genre and hobby. Peruse your local bookstore and you'll find crocheting magazines, pet magazines, political magazines and much more. And outdoor and adventure topics are not any different. In fact, there are probably more outdoor and adventure magazines in existence when you factor in biking, hiking, boating, and kayaking topics. But, with all of these choices, which ones cater toward the overall outdoor experience? Which ones feature in depth articles, interviews, and equipment reviews? Simply put, which ones are the best and, more importantly, for your area of outdoor interest? National Geographic Adventure - We've all heard of National Geographic. But, did you know it's sister publication is arguably one of the best outdoor/adventure travel magazine on newsstands? Last year, it took gold in the coveted Lowell Thomas Awards for best overall travel magazine. This month issue features twelve backdoor getaways for paddling, skiing, and hiking. 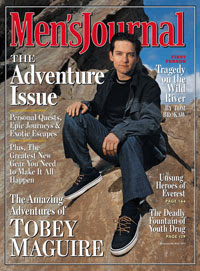 Men's Journal - Although they've recently shifted editorial focus from adventure travel, outdoor enthusiasts can still read insightful and informative articles on its pages. Check out this month's issue for two moving stories about Mount Everest's Ice Doctors and a journey to Africa in search of "lost waves". Outside - For interviews with adventurer travelers, no one beats Outside. Regular contributors are outdoor connoisseurs Bill "A Walk in the Woods" Bryson, Sebastian "The Perfect Storm" Junger, and Tim "Lost in My Own Backyard" Cahill. An depth guide to National Parks, the best outdoor and adventure Jobs of 2007, and an engaging story about a little known American battalion in Papua New Guinea round out this month's edition. Lately, I've been dying to go to Iceland. I want to see the countryside and soak in the famous springs. 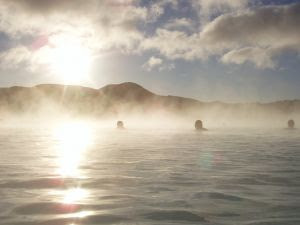 Iceland is not a cheap country and a trip there would definitely not be one on a budget. It's also an off the beaten path destination, which you know I love. So, what about you? If you could travel anywhere in the world, without restrictions, where would you go? And why? Italy. It’s a name that instantly conjures visions of languid canals occupied by black and gold decorated gondolas, chic boutique hotels, and a rich culture heritage, set in one of the most scenic locations in the world. But, that awe can wear thin as soon as you try to plan a trip to one of the most beautiful countries in the world. For some travelers, the overwhelming options of hotels, attractions, and activities can seem endless. However, armed with the right information, it’s a possible to plan a stress free vacation. Here’s how to turn a vacation to Italy from a nightmare to a dream. For more information or to register, please send an email to travelerspen@yahoo.com or leave comment. Having trouble researching and planning your next vacation? Overwhelmed by travel sites, hotels, airfare, and more? Need a little help? If you have questions about a particular destination, a complex trip to plan, or not sure where to begin, consider a personalized trip consultation from an experienced traveler. I can assist, coordinate, or plan your adventure. I'm a freelance travel writer based in Atlanta. My work has appeared in National Geographic Traveler, Men's Journal, Women's Health, Hallmark, Every Day with Rachael Ray, Backpacker, Draft, and more. Subscribe to The Traveler's Notebook! Do you dream of wandering the back alleys in Venice, climbing Machu Picchu, or taking an African safari? Don’t think you can afford it? Well, you can! Learn to travel the world on a shoestring budget by using secret budget tips and methods from a veteran budget traveler and freelance travel writer. You’ll learn to define your travel personality, establish your budget traveler status, and prepare a daily budget. By the end of class, armed with learned strategies, you’ll be well on your way to Paris, Peru, or Phnom Penh! For more information or to register, send an email to travelerspen@yahoo.com or leave a comment.